This is the cover of my new book which, although I’ve just finished writing it, is already on Amazon. So that means it’s really going to be published next year. Which is very thrilling indeed. 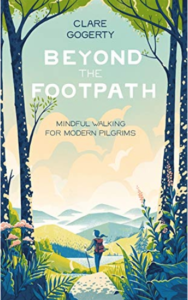 The book is about modern pilgrimage: walks to places with meaning, be they along traditional pilgrimage routes, up a mountain, to an ancient tree, or just a shuffle around town looking for a blue plaque. It has been tremendously enjoyable to research: I have spent much of last year striding purposefully (but mindfully!) along ancient tracks and waymarked paths, through ancient woodland and into the heart of labyrinths. The book includes personal accounts of all these adventures plus recommendations, musings, and mindful exercises. If it doesn’t make you pull on your walking boots and head out on the footpath, I will have failed in my endeavours. So there it is, out next April, £14.99, and published by the lovely folks at Piatkus Books.